Coorg is known for its flawless scenic beauty. If you are a nature lover then it's the perfect place to visit during monsoons. Though the nearest railway station is Mysore, we took a train from Hyderabad to Bangalore and did a road trip from there. 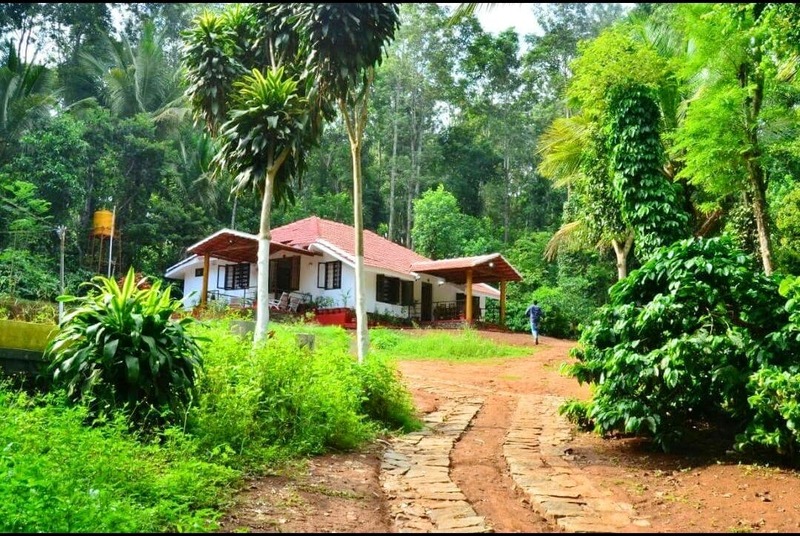 We stayed at a beautiful villa in Karadigodu near Coorg, located in the woods with so much greenery around, I just fell in love with the place. It can easily accommodate 10-12 members. We got this place through some agent and the hospitality was so on point. Oh, and they served us delicious home cooked Karnataka food. Coorg is adorned with dozens of gorgeous places that one should visit, here's the list of all the places that we covered: Abbey Falls: It's the centre of attraction among the tourists. You can also visit the coffee plantation amidst the path and stop for some bird watching. Plus, there is a waterfall even in the dry seasons. Namdroling Monastery: Visit the Monk's temple and learn about their lifestyle. Don't forget to have lunch there, the Tibetian food served here tastes SO good. We waited for almost an hour for the food. Dubare: You can participate in so many activities here - from bathing and feeding elephants to river rafting. Rafting in the rain is a great experience. You'll find delish authentic Karnataka food here. Oh, and Coorg wine has the best options to try. It's also famous for its spices, honey, and coffee. Additionally, a special mention of De Parathzzaa Cafe on the highway from Mysore to Coorg, it was the best cafe that we visited during our trip. They do this fusion of parathas and pizza, something that you should definitely try.